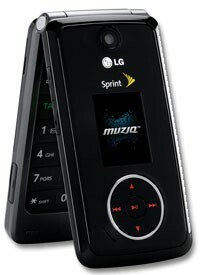 Sprint today announced the LG Muziq, the successor to last year's Fusic music phone. The Muziq retains all the same features of the previous model while updating the looks. It has a sleeker shape with an internal antenna. The music control pad on the cover has also been updated to a touch-sensitive unit with vibration feedback. The Muziq retains all the features of the Fusic including 1.3 Megapixel camera, which is now moved to the front of phone, stereo Bluetooth, FM transmitter and MicroSD card slot, which is now SDHC compatible. The Muziq will be available on July 15. Sprint and LG today announced the availability of the LG Fusic - a new EV-DO handset with a focus on music. Not only does the Fusic feature Sprint's music player and music store with external playback controls, but it also can broadcast your music over both stereo Bluetooth (A2DP) or FM radio. The FCC today approved a new high-end Samsung phone that is almost certainly the company's forthcoming Note 8 flagship phone. If Samsung chooses a new branding for its Note series, this phone will be the spiritual successor to the ill-fated Note7. YouTube today announced YouTube Premium and YouTube Music, services that replace YouTube Red and YT Music, respectively. Moving forward, YouTube Premium will be the video site's top-tier service, offering originals, ad-free play, background play, and downloads across YouTube. Awwww, Sprint ain't that bad, lol. I used to work for them, and have the Fusic, aka the "Funstick", and have had no problems with it at all. I hope the newer version is a lil better in the looks dept. Also, its an LX model. That means Sprint. If it was VX it would go to Verizon and AX would go to Alltel, and UX goes to US Cellular. Here's a wild quess koziekat. LG and Sprint have an agreement on certain models, just like VZW and LG do. VZW-Chocolate line-up Sprint-Fusic, and now the Muziq. Sprint does have the largest Music library, and Sprint Radio. Also consider the excellent Data network, Sprint is my only choice. i not use but in viewing this look goods. Rich - In your opinion which phone is better in way of features. This one or the upcoming Rokr z6m or Razr v9m, all of which I believe are coming to Sprint. Also do you think all of these will run the new Sprint Navigator? I'm pretty sure all new mid- to high-end Sprint phones will support LBS apps like Garmin and Sprint Navigator. I'm using Garmin on the Musiq right now. Works fine. Hi I might have missed this, but is this phone EVDO? ...the FM transmitter and wish more phones had it. A friend of mine had his Fusic on a recent trip to Ruidoso, I'm with AT&T and was using a Treo 650, and we wanted to hear some tunes on his phone and some on my memory card, so we used it in the car and with a small CD player we had in our cabin. Definitely came through in the clutch. And I remember saying it looked like a VX-8500 Chocolate. It actually looks like a combination of the 8500 and the 8600.